The Upstate is not shy of dazzling displays! The most stunning Christmas light shows the Upstate, SC has to offer make spending the holidays in the county even more magical. Around Thanksgiving, the greater Greenville area transforms into a magical wonderland with all the Christmas lights. Start your own holiday tradition this year by checking out these spectacular light shows in the greater Greenville area. These light displays and holiday light shows will surely brighten your nights. Whether you prefer a synchronized music and light extravaganza or a sophisticated drive-through experience, here are the best Christmas light displays in greater Greenville. Most of these houses and places light up around Thanksgiving. Lights go up and are best seen when dusk hits. Be sure to visit their Facebook page before going as current announcements and information are posted there as well as traffic rules. Also, please be courteous of the others viewing the displays as well as the other houses in the neighborhood. Greenville Griswold is back with a new name – Passion of the Lights. They have moved their Christmas Light Show to the Edge Community Church property at 506 Edwards Rd in Greenville. Passion of the Lights is displaying over 500k light synchronized to music played on 88.9 FM. Light Show starts on November 22nd until December 25th. Dusk to 10 pm. Check out their Facebook page for the latest update. Entrance only from Edwards Rd coming from 291 (right turn only), Also upon leaving, right turn exit only. Displaying 80k lights with music ( Tune in to FM 92.1). Visitors are asked not to block the road. Display starts on November 22nd to December 29th from 6:00 pm to 10:00 pm each night. Check out their Facebook page before visiting as they announce if there will be no show in case of a bad weather. 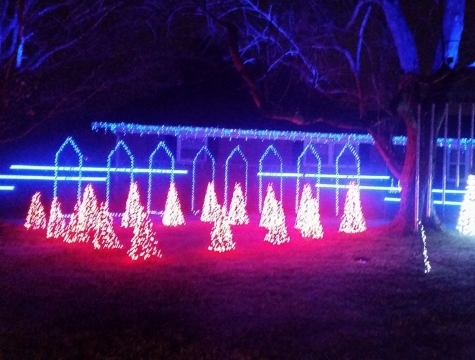 Lindsey family has over 150,000 static lights on display. Visitors are requested to park on Trade Street and avoid blocking the neighbors’ driveways. Visitors can walk around the yard. Lights are open from November 23rd until December 29th at 6:00 pm -10:00 pm. Visit their Facebook page for more information. The Nodine family continues their annual Christmas light display with 25,000 lights controlled on 1,500 channels. Drive by and watch a fully synchronized show from November 22nd until December 31st from 6:00 pm to 10:00 pm nightly and tune to 87.9 FM for the music. Over 25,000 animated light display. Tune into 89.5 FM to hear the music. The display show is open to the public from November 25th until December 31st from 6:00 pm to 10:00 pm nightly. Find out more about the display by visiting their Facebook group here. They are also accepting donations for Calvary Children’s Home. The Turney Family Christmas has over 300k animated lights on display accompanied by music. Tune to 87.9FM. The display will be up for all to enjoy on November 22nd until December 26th. Visitors can drive through from 6:00 pm -10:00 pm. Visit their Facebook page to find out more. Two houses synced to display beautiful Christmas lights accompanied by music. Tune in to 97.1 FM. The light display starts November 22nd to December 31st from 6:00 pm to 10:00 pm. Watch out their page for further announcement. Large static Christmas lights display of over 100K. Lights are open from November 23rd until January 1st from 6:00 pm to 10:00 pm nightly. The show is free for all but donations are appreciated and will benefit an animal rescue foundation. Watch out their Facebook page for further announcements. Fountain Inn Christmas Lights displays around 15k static lights with blow molds, inflatables, and one of a kind pieces. Check their Facebook page for special events. Lights are open from November 27th until January 1st from 5:30 pm to 11:00 pm. Now with over 10k lights and 20 inflatables and movie clips from your favorite Christmas movies, lights are open from December 2nd until January 1st 24-hrs a day but are best viewed after dark. 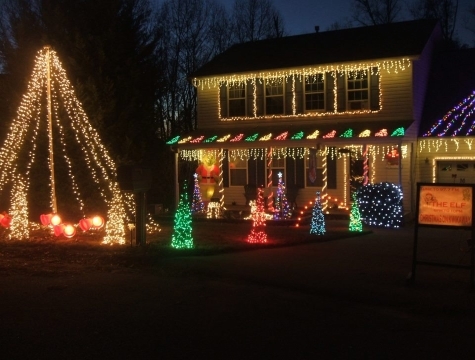 This home makes some amazing holiday light displays for Christmas. Up to 24,000 synchronized lights on display with music which you can hear by tuning in to 96.7 FM. Lights are open from November 23rd until January 1st from dusk to 10:00 pm nightly. Visit their Facebook page to find out more. 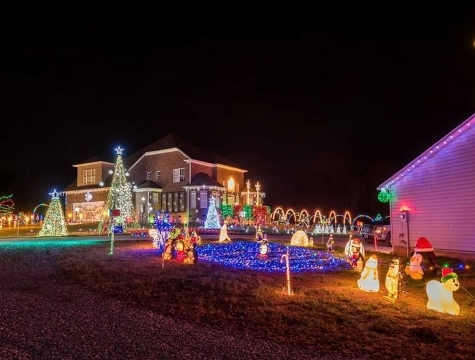 William family has 20,000 static lights on display. Lights are open from November 22nd until January 1st. 6:00 pm -10:30 pm nightly. Visit their Facebook page to find out more. Thousands of lights light this home in Cherish Drive. The display show is open from November 22nd until December 31st from 6:00 pm to 10:00 pm(Sun-Thurs), 6:00 pm to 11:00 pm (Fri-Sat). Tune To 107.7FM. Check out their Facebook page before visiting. The Allen Family Christmas display includes a computer controlled 26k light show with leaping arches, a mega tree, and strobe lights. It is open to the public from December 1st until January 1st from 6:00 pm to 10:00 pm (Mon-Fri) and 6:00 pm to 11:00 pm (Sat-Sun). Tune in to 98.6 FM for music. The Montgomery family continues the Blackwell family tradition by sharing the spirit of Christmas with everyone. Drive thru a light display of over 100,000 lights synced to music. They do not charge, but there is a donation box if anyone wishes to help with expenses. The display show is open from November 24th until December 31st from 5:30 pm to 10:00 pm nightly. Find out more about the display by visiting their Facebook page. There’s a hand-painted Nativity display, over 5,000 static display of lights, and an animated light show that incorporates 14,000 lights using 64 channels to see when you visit Reidville Presbyterian Church from November 26th until December 25th, 6:00 – 10:00 pm nightly. Visitors can park in the church parking lot and tune to 104.3 FM to listen to songs synchronized to the lights, along with scripture reading about the birth of Christ. Find them on Facebook. Large static and animated lights display. Open to the public from November 22nd until December 31st from 6:00 pm to 10:30 pm nightly. Tune in to 92.1 FM for music. Jordan Family Lights is open to the public from December 1st to January 1st. They have a large static display of lights on trees and on the house as well as inflatables. Bring the kids on Friday, Saturday, and Sunday nights as they run a children’s barrel train. Lights are open from 7:00 pm to 10:00 pm on Mon-Thu and 7:00 pm to 11 pm on Fri-Sun. Enjoy the Poole’s Christmas light show consisting of over 20,000 computer controlled lights, synchronized to music on 48 LOR channels and 49 DMX from November 22nd until December 26th, 6:00 pm – 10:00 pm (Sun-Thurs) 6:00 pm – 11:00 pm (Fri-Sat). Check out their Facebook page for more updates. Enjoy Christmas light display consisting of LED net lights, string lights, twinkling lights, arches, blow ups and lit figures from December 1st until January 1st, 6:00 pm – 10:00 pm Daily. Tune in 107.7FM for music. The Belcher family continues their light display tradition from Jacksonville, Florida by sharing the spirit of Christmas with everyone. Drive thru a light display of over 18,000 lights. The display show is open from December 1st h until January 1st from 6 pm to 10:00 pm nightly. Continuing their age-old tradition, the Williamston Christmas Park is open for all visitors to see the beautiful lights in the park, then stroll over to the Historic Town Hall to view all of the beautiful Christmas Trees. It is open from 6 pm to 9 pm from November 24th until December 31st. Bring the whole family and enjoy the biggest interactive LED light show in the Upstate with 32 million colors synchronized to the music of classic Christmas songs. The show lasts for 30 minutes with 100 interactive new displays and music at the comfort of your car. Drive thru or park your car and watch the Christmas light show. Tickets are sold at their website at $20 per car. The show is open from November 22nd until December 31st, Sun – Thurs 5:45 pm to 10:00 pm, Fri – Sat 5:45 pm to 11:00 pm. 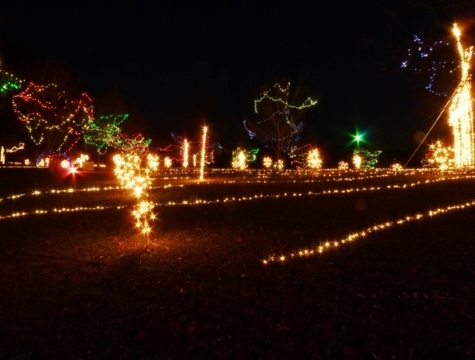 View more than 5 miles of outdoor Christmas light displays at Anderson Lights of Hope. It’s also more than a Christmas light show because this organization is giving back to the community. Its profits are benefiting local charities. There will have a Santa Village and a festival of 3.5 million Christmas lights! Have fun with the whole family! The price for admission is $10 per vehicle and $20 for bus with 15+ passengers, open every night at 5:30 pm till 10:00 pm from November 22nd until December 25th. This year is the 27th Annual Holiday Lights Safari Benefit. 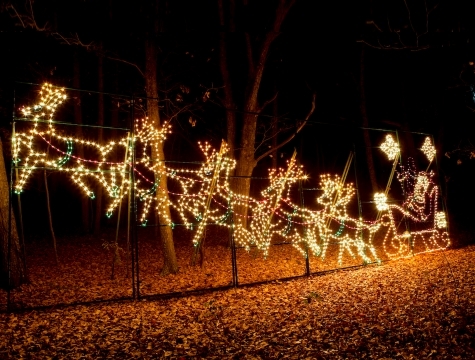 Drive through millions of twinkling holiday lights throughout the nearly 100-acre animal park. Visit Santa’s village and see many animals in the barns or visit Mrs. Claus’ attic for an incredible panoramic view of the lights event, then drive through the Enchanted Deer Forest where you can hand-feed animals from the comfort of your car. The price for admission is $6 per person, admission includes access to Santa’s Village, $10 per car additional fee to go through the Enchanted Deer Forest. The Holiday Lights Safari is open 6 pm to 9 pm from November 16th until January 5th.